Due to insurers concern about the risk of property damage by Japanese Knotweed some lenders recently reviewed their policies in relation to this highly invasive species. The onus is now on Surveyors to consider Japanese Knotweed when valuing properties and producing Home Reports. Property valuations and Home Reports affect the conveyance process so it is important that a correct identification is made. KleerKut have been involved in a number of property sales where a plant has been incorrectly identified as Japanese Knotweed when it is not. These mis-identifications result in delays concluding / unnecessary costs and stress to the seller and can even result in a lost sale. Why is Japanese Knotweed being Incorrectly Identified? Simply because the increased concern about Japanese Knotweed has resulted in people carrying out identifications who have little or no experience in this area of expertise. For the inexperienced Japanese Knotweed can be difficult to identify, particularly in the winter months when the plant has died back and only dead stalk or a crown remains. Japanese Knotweed Confirmed on the Property? Once Japanese Knotweed has been confirmed following the recommendations set out in the recent Royal Institute of Chartered Surveyors (RICS) paper on Japanese Knotweed will ensure that you achieve the criteria required by the Council of Mortgage Lenders (CML) and the Building Societies Association (BSA). 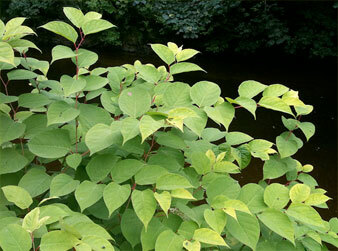 Contact KleerKut to obtain advice or a quotation from an experienced Japanese Knotweed Specialist. Successful eradication of Japanese Knotweed requires experience and specialist knowledge. KleerKut has been dealing solely with Japanese Knotweed and other invasive species since 2006.